It’s hard not to feel a tinge of civic pride and satisfaction after watching Visit Spokane’s newest promotional video of the city. “Whoa, I live here?” you might think. Yes. It’s a pretty cool place, and Visit Spokane's video does a good job of selling it. Long, slow shots of the city and surrounding area depict its natural beauty and cool things to do. 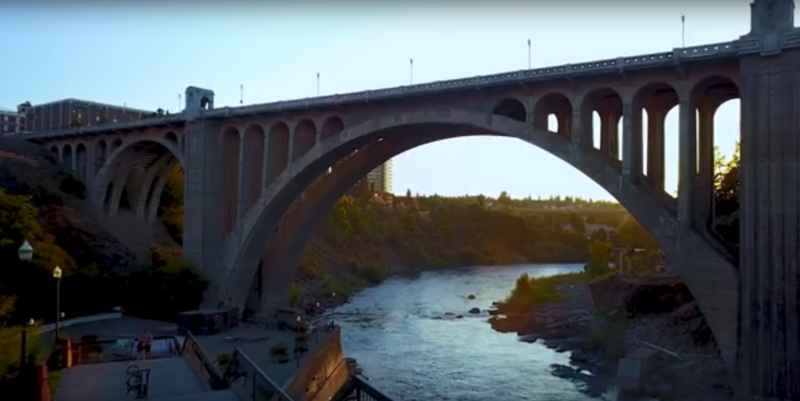 Aerial shots of the city’s neighborhoods, Spokane River, mountains and public parks (all in perfect weather, of course) set to some chill background beats show an ideal city to live in. “What makes a region a destination? Everyone has their own opinion. But when a place like the Spokane region has it all, it's tough not to sing its praises. Blessed with a unique combination of outrageous outdoors and amazing attractions, incredible arts and delectable dining, and a historic past living seamlessly with a vibrant future. From thrilling whitewater or downhill adventures, to inspiring art and powerful Broadway performances, the Spokane region offers enough activities to pack any vacation calendar." True enough. The video depicts something for everyone: delicious food, roasting coffee, a vibrant downtown, live music, public art, mountain biking, rock climbing — and it wouldn’t be Spokane if we didn’t have at least eight seconds of time dedicated to Gonzaga basketball.